New York, NY - (11/1/2011) - Glen Johnson and Allan Green have been longtime friends and sparring partners, and most recently were opponents against one another in 2010, as part of the SHOWTIME Super Six World Boxing Classic. Now, the two will enter into hostile territory together this Saturday night when they travel to Quebec City to take on two of Canada's favorite sons. "The Road Warrior" Johnson (51-15-2, 35KO's) is set to challenge IBF Super Middleweight Champion and arguably the number one fighter at that weight class, Lucian Bute (29-0, 24KO's), in the feature bout of the evening on SHOWTIME CHAMPSIONSHIP BOXING card from the Pepsi Coliseum in Quebec City, Canada, live on SHOWTIME® (9 p.m. ET/PT, delayed on the West Coast). 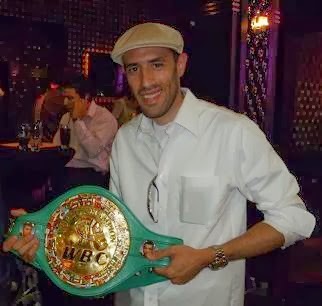 Fighting on the untelevised portion of the undercard will be Green (30-3, 21KO's) taking on Sebastien Demers (31-4, 11KO's) in a ten-round super middleweight showdown. The event is promoted by Interbox, DiBella Entertainment and Warriors Boxing. Both fights are very significant, and crucial to the careers of both Johnson and Green. At 42-years-old, the former light heavyweight champion Johnson isn't getting any younger, and is 4-4 in his last eight bouts, albeit the four defeats were close decision losses coming in world championship opportunities. A win over the pound-for-pound top-rated Bute could set Johnson up for a crack at the winner of the Super Six Tournament Finale that takes place on December 17, between Andre Ward and Carl Froch. Green, after spending much of his career struggling to cut weight, has now made the decision to move back up to the light heavyweight division, where he hopes to position himself into a world title opportunity. Before he can do that though, he must first get past Demers. For information on SHOWTIME Sports Programming, including exclusive behind-the-scenes video and photo galleries, complete telecast information and more, please go to the new SHOWTIME Sports website at http://sports.SHO.com.